I chose to read in Hiligaynon, the language of Iloilo, the city where I grew up in. I read to my 2nd son’s class (this is his 1st year at Dwight) and he was very much involved with the translation for his classmates. 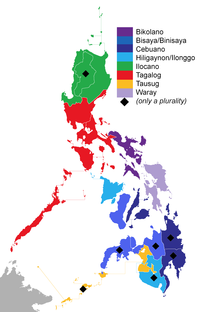 Most people, even Filipinos, think that we only have “Filipino” as our language and the others are mere dialects. I leave the discussion to our linguists or else this will occupy my whole blog post. Here’s a visual (incomplete) representation of our regional languages. John, a professor at the University of the Philippines – Visayas, is an active Ilonggo writer and is one of the Commissioners of the Komisyon ng Wikang Filipino. I explained to the first graders why this book and this language is special to me and showed them the author’s personalised dedication for my 2 boys. It’s easy to fascinate the little ones so they replied with a “wow” and my son grinned with pride! I brought a Philippine map and showed the first graders the Visayas region, particularly Panay and Iloilo, emphasizing that I was born and grew up there. My son pointed Luzon and we told the class that his Dad was born and grew up in the Luzon area. We focused on the Visayas Region since the storybook talks about how the islands in the Visayas came about. It was amusing to see the children’s reactions and entertain their questions. The Library was festive the morning of the VIP Reading Day. LeRuof had to remind me that he needed to be early because members of the Student Council were invited to take part in the breakfast ceremony organised for the VIP Readers. My 4th grader is Secretary of the Lower School Student Council. I’m Secretary of the Parents’ Association (oh no, he isn’t emulating me! lol). The members of the PA Executive Board were also invited but we thought it was too early for us to go to school:-). Instead, I arrived before my 9:00am reading schedule. Although there are only 3 Filipino families at Dwight, we have always managed to have our country represented. I have been doing VIP Reading since my first son came in (4th year now) and another Filipino mom volunteered last year. Our Philippine Embassy sent representatives for 2 consecutive years already. Last year, our Cultural Attache read to (last year’s) 4th graders. This year, our Third Secretary and Vice Consul read to this year’s 4th graders. LeRuof is still learning how to speak Filipino but he can understand the language.We will keep going and we will keep inspiring and encouraging him. Filipino isn’t a shared language with any of his friends here in Seoul so his only source is me and my husband. Manolo, our Filipino Tenth Grader, requested to have a session with the young students. I loved it when I learned that he read to the children because he “wanted to let the Lower School children hear another language. Filipino is not as popular as Spanish or Chinese or Japanese or French”. Because of this, he added that he wanted them “to know that there is a language called Filipino“. VIP Readers come from parents, invited guests from the community and the embassies. I am not sure, but he is the first student that I know who read during the VIP Reading Day. Kudos! He deserves to be thanked for this initiative. He is modelling this attitude to the younger Filipino kids at school. As a Mom, I take comfort that we are bringing up global citizens who keep in touch with our Filipino roots. Mabuhay! Well done! It’s so important for kids to be plugged into their mother tongue, it’s such a vital link to their culture. It’s awesome that you’re doing that not only for your son, but for the other kids at Dwight. Also, what a cool experience for them, to be able to learn about a culture different from their own. Being able to read and speak another language is such an incredible skill and one that I wish I had.. It’s great to see you are encouraging the children to do so from such an early age. Looked like a fun day too, great pictures! Nicole recently posted..How Enlightening Really is a Templestay in Korea? i’d been watching korean dramas lately and i’m learning to love the sound of it:-) my children can understand Korean very well but needs more confidence speaking it.